A surgeon at Yale University gave his six-year-old son a big surprise by giving the family boat a complete stem-to-stern Plants vs. Zombies paint job. Dr. Edward M. Uchio is an Assistant Professor of Surgery at Yale University's School of Medicine. He's also a big fan of the hit PopCap game Plants vs. Zombies, as is his young son. The final piece of the puzzle: he owns a boat. 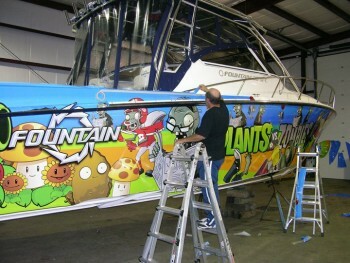 Put it all together and what you end up with is the coolest Plants vs. Zombies Fountain boat ever to hit the high seas. Whether the paint job was prompted by a special occasion or Uchio is just the coolest dad on the waves isn't made clear, but it hardly matters. What's important is that this latest manifestation of the obsession people have with Plants vs. Zombies is one seriously sweet-looking vessel. But hey, where's the dolphin? More photos of Uchio's awesome PvZ boat are available on Facebook.